Fran: Welcome to Fresh Text, I’m your host Fran Sammons and today we are talking with first-time author and motivational speaker, Andrew Dix, whose book “Life Matches: Fire Up Your Life!” has been recently been published by Booklocker.com. Thanks for joining us Andrew. Andrew: It’s my pleasure Fran. Thank you for having me. Fran: Tell us briefly about your book. It’s a terrific book for a business trip since it is only 110 pages. 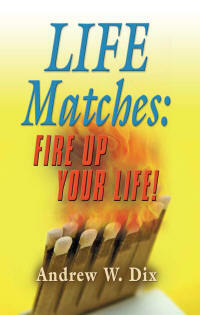 Andrew: Yes, “Life Matches: Fire Up Your Life!” is a book that is very easy to read, but much more difficult to live. It’s a story of Tim Davis, a middle-aged, middle-manager, who has recently been promoted to a high pressure state sales director’s role at a cable television advertising firm. He’s married with two small daughters and he is beginning to fizzle out both professionally and personally. The book is business-fiction with a self-help plan included to help a reader fire up his or her life. We watch Tim’s life quickly unravel and then see if he can put the pieces back together with the help of a co-worker coach, named Paul Andrews. Paul is developing a presentation on strengths-based leadership for an upcoming management conference at the advertising firm based on Tom Rath’s “StrengthsFinder 2.0” book. Paul reviews his presentation with Tim and end’s up helping Tim put the presentation’s key points to practical use by helping Tim to fire up his life. Fran: I’ve read Rath’s “StrengthsFinder 2.0” book and took the online personality assessment. It did describe my strengths very well. Andrew: Tom Rath and the people at The Gallup Company have created a really helpful tool for most people to discover their personal strengths. Think of a strength as being something that you are both naturally good at doing and also greatly enjoy doing. Rath’s concept is simple, do what you love to do and are good at doing more than trying to fix what you are not very good at doing and hate to do anyway. This is the key concept that I explore in my book “Life Matches: Fire Up Your Life!” We see my character Tim Davis discover his strengths and then make choices to better manage around his weaknesses or as I prefer to call them, areas of limited capacities. If we can keep our limits from limiting our success by developing management strategies to minimize their impact, then we can use our strengths more and successfully live a fired up life! Fran: In your book Andrew, you take Rath’s strengths principles and make them workable for the average person. Can you describe for us what you mean by a life match? Andrew: Sure. I wanted to give people a physical reminder of their commitment to live a strengths-based life that was more fired up. We know from many psychological studies about changing habits that it takes 20 or more days of practicing a new skill or thought for it to become a habit. Most of us need a physical reminder to help us stay focused on what we are trying to change in our life. My idea was to use a book of paper matches to reinforce the benefits of living your life by using your strengths. The matches become a key tool for an exercise to make the strengths concept personally meaningful and then if you carry the matches with you every day for the next twenty days, then you have a better chance of actually changing the way you live your life so that you focus more on using your strengths and managing your limits. As you do this, you start to feel happier, on-purpose and successful or as I say, fired up! Fran: But why did you choose matches to represent strengths? Doesn’t a match burn out quickly and get thrown away? Andrew: That’s true about regular matches, but I took some literary license with my definition of a life match. Each match represents a God giving gift or talent that you were naturally born with. The challenge in life is to discover what matches you’ve been given in your pack and how and when to best use them. Life Matches only burn out when you do. You get to choose when and where you light one of your life matches. If you choose well, you will not only fire up your life, but you can spark others’ lives as well and maybe even be a bright light to our very dark world. Fran: I really like how simple you have made the very difficult life change process seem. I cannot tell you how many New Year’s resolutions have come and gone undone because I simply forgot about them. A little reminder like your Life Matches can really help. Andrew: Thank you. Change is hard. We all back slide to our old habits from time to time and need a reminder of what we are trying to change for the positive. Life Matches can be that reminder. Fran: Your character Tim Davis’ pre-teen daughter Savannah has Attention Deficit Hyperactivity Disorder or AD/HD. She seems to be a real challenge and frustration to Tim’s parenting skills. Why did you choose to include this unusual character trait? Andrew: Well, AD/HD plays a major role in my immediate family. Both of my daughters and my wife are impacted by AD/HD symptoms. It’s estimated that 10% of the US population has some form of AD/HD and I wanted to try to raise some awareness about this disability that affects so many people. Fran: You also want to raise some money for the national non-profit AD/HD support organization, CHADD correct? Andrew: I sure do. I donate all of my author’s proceeds from each sale of “Life Matches: Fire Up Your Life!” to CHADD. CHADD is one of the best non-profit national resources for unbiased, factual information and support for people with AD/HD and for those like me, who love someone with AD/HD. You can learn more at www.chadd.org. Fran: I see that you also have a website and a blog. Andrew: I try to spark people with many different social media. My website is www.lifematchesbook.com. Readers can download an excerpt of the book as well as the worksheets and discussion questions for Christian small group study. You can link to my blog from there as well as follow me on Twitter and participate on a special Life Matches Facebook discussion site. Fran: You make no apologies for your professed Christian faith. Do you feel like your religious views might possibly be a negative for many readers? Andrew: I hope not. I am Christian. It is my world view and it shapes my beliefs and writing. I tried to be candid about that in the preface of the book. I believe that God uniquely creates each of us and gives us a set of strengths that are designed especially for us to play a part in his plan. It’s what leads us to discover our life’s purpose or calling. Fran: What advice to you offer someone who is looking for ways to improve their life? Andrew: I think Dr. Wayne Dyer says it best. Do what you love and love what you do. Life is a one time live event. There are no refunds or reruns. We have to do the best we can with what we have to work with. I know that it just makes sense to live this way. Using your strengths allows you to be more of who you were born to be. Fran: And it makes you feel fired up? Fran: Andrew Dix, Author of “Life Matches: Fire Up Your Life!” is available from Booklocker.com, Amazon.com and Barnes and Noble.com. It is available as an e-book for i-pads. Andrew it’s been great speaking with you. Andrew: Thank you. It’s been my pleasure Fran.